As much accolade goes to President Muhammadu Buhari for signing into law the bill criminalizing the discrimination of people with disability in Nigeria, on Wednesday the 23rd of January 2019, it brings us, without hesitation, the moment of asking many questions. The Discrimination against Persons with Disabilities Act, according to Ita Inang (Ogundipe, 2019) will demand harsh sanctions and punishment from individuals or corporate bodies found guilty of discriminating with People with Disabilities (PWDs). Speaking from the standpoint of deaf children in Nigeria, who are among the most vulnerable population, I can’t stop wondering how this bill would affect parents of deaf children whose ignorance and disinformation lead to deprive their deaf children access to early signed language. Recall that our over-four-years studies in Nigerian Deaf Community, (NDC) show that over 75% of children that became deaf from birth till the first five years of their lives have little or no access to (signed) language until they are enrolled in a Deaf school where they begin the struggle of learning both their first and second languages. This has been proved to be the result of a huge cognitive and linguistic skills deficiency common among deaf children in Nigeria, the academic language gap and ultimately the communication gap between the deaf children and their families, which is the bedrock of Deaf stigmatization – folks, this is the real curse, not deafness itself. I can’t stop wondering how this bill would affect parents that deny their deaf children basic education, just because they are deaf, even when education at that level is almost free. I won’t be in a hurry to forget, Chioma, a 13-year old deaf girl who was withdrawn from school by her parents at Elementary three. We knew about Chioma’s case in 2018 and decided to take up her case. After our inquiries, we concluded that the parents were unwilling to send her back to school despite Chioma’s love for education, plus her frustration to live in a family of other four hearing siblings with hearing parents, none of whom can sign. 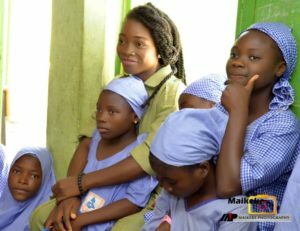 With the parents’ approval, funds were raised to send Chioma back to school with a new set of school uniforms, books, food to live in the dormitory and other payables (that are not tuition). Chioma was registered at the Special School for the Deaf Kuje, and we required of the parents to be visiting her as at when due. Unbelievable as it may sound, before the end of the first academic session, the parents began complaining that they could not continue to visit Chioma in school because there was no transport fare to go to her school and no food to give her. Consequently, we took up the responsibility of visiting Chioma and filling her food supplies for the rest of the term. At the beginning of a new session, we prepared Chioma to go back to school, but to our surprise, the parents refused her to go back to school. Chioma is one out of very many deaf children in Nigeria, both in the rural and urban areas, who are denied basic education, just because they are deaf. Now that the Disability Right Bill is signed, denying a deaf child basic education or access to [an indigenous] signed language becomes a crime. I keep wondering what would happen to such parents as those of Chioma if they are caught in the act. You may be surprised to know that almost every case of congenital or developmental hearing loss in children in Nigeria has something to do with the parents’ ignorance, carelessness, misinformation, or genetic factor. Isn’t it a double punishment for a deaf child to be denied access to language or quality education by the parents whose action or inaction, remote or immediate must have led to the child’s hearing loss? How would our Bill for Disability Rights judge parents’ discrimination of their deaf children – language deprivation and education denial? Now that our Bill on Disability Rights is signed, the part that scares me most is the absence of early detection/early intervention for deaf children, which is a remarkable flaw on the part of the government. Studies (such as, Yoshinaga-Itano et al, 1998, Moeller et al, 2013, Jones et al, 2015, Murray, 2015, Hall et al, 2018) have shown that deaf children would develop the linguistic and cognitive skill set needed for academic and communicative excellence if exposed to signed language immediately after early detection of hearing loss before age five. How would our Bill for Disability Rights judge our government if after signing the bill, there is still no provision for early detection of hearing loss in all government hospitals? Every newborn should be screened for hearing loss among other things before leaving the hospital. A child confirmed deaf at an early screening and his or her family have the right of early signed language exposure before the child grows beyond the age of critical development. How then can we successfully create language access to an indigenous deaf child without an indigenous signed language? How can we help a deaf child acquire language, when the available signed language is only taught in school and is English based? (Just thinking aloud). It is my pleasure to share some of these thoughts with you. As we celebrate the Disability rights Bill that has been signed into law, let us begin to have a picture of what its implementation looks like and a picture of where we stand – on the side of knowledge or on the side of ignorance. This piece is dedicated to the population of Nigerian Deaf children currently being denied access to signed language and access to basic education. Moeller, M.P., Gwen, C., Seaver, L., Stredler-Brown, A., Holzinger, D. (2013). Best practices in family-centered early intervention for children who are deaf or hard of hearing: An international consensus statement. Journal of Deaf Studies and Deaf Education. Doi: 10.1093/deafed.en034. downloaded from http://jdsde.oxfordjournals.org. Murray, J. J. (2015). Linguistic human rights discourse in deaf community activism. Sign Language Studies, 15(4) 379-410. Washington DC: Gallaudet University Press. Ogundipe, S. (2019, Jan 23rd.). Buhari signs law banning discrimination against persons with disability. Premium Times. https://www.premiumtimesng.com/news/head. Yoshinago-Itano, C. Sedey, A.L. Coulter, D.K. Mehl, A.L. (1998). “Language of early-and later-identified children with hearing loss.” Pediatrics. 102: 1161-1171.